An important event each year is the annual Kagyu Monlam, held in December. 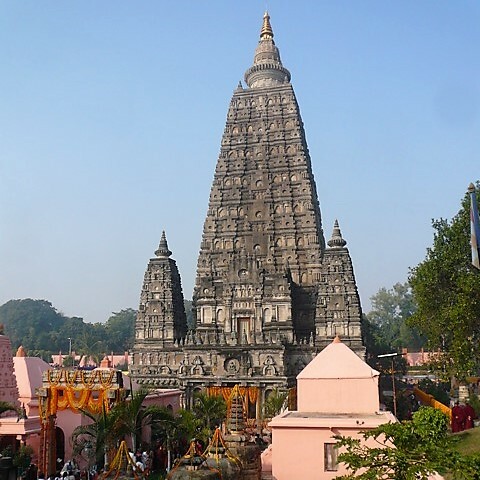 Monlam means ‘aspiration prayer’ and is held in the very special place of Bodh Gaya in the state of Bihar in India, where Buddha attained enlightenment under the Bodhi tree over two thousand five hundred years ago. The prayers are led by His Holiness 17th Gyalwa Karmapa Thinley Thaye Dorje, the head of the Karma Kagyu lineage. His presence makes this a very special occasion. 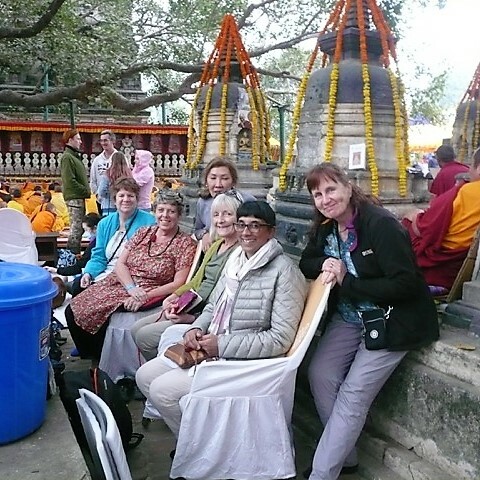 A few Kagyu Ling members made the journey over to India to participate in the 2018 Monlam. 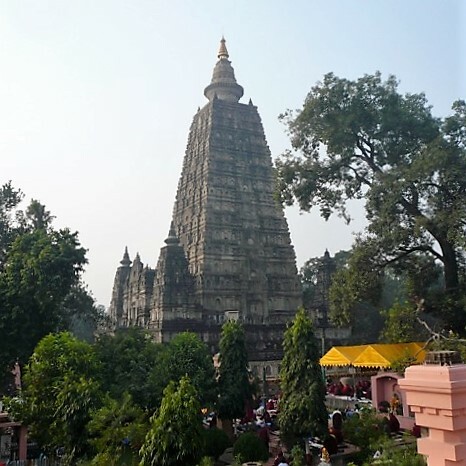 We began auspiciously by meeting up with our main teacher Lama Jampa Thaye and his family at the Mahabodhi temple. They had been attending the South Asian Buddhist Association meeting which takes place every year just before the Monlam. Buddhist flags fluttered in the breeze in rows interspersed with colourful foil which glinted in the sunlight above the heads of the thousands of monks, nuns and lay people who streamed in through the gates each day to recite aspiration prayers for the benefit of all beings. 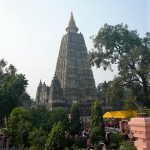 The Mahabodhi temple’s main stupa reaches high into the sky and is surrounded by people doing kora (circumambulation), making floral offerings or reciting prayers and mantras. 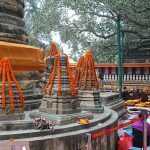 The atmosphere changes from the hustle and bustle of daily life to one that is somehow indescribably special and pervades the whole of the temple area. The temple area has three levels. The outer level is filled with Buddhist monks and nuns in a variety of colours from the saffron robes of the Theravada to the maroon colour of the Tibetan monastic sangha. Stairs lead down to the middle level where people can be seen doing kora and adjacent to this is an area of prostration boards where many monks and lay people take the opportunity to do prostrations and meditation practice. At the bottom is the inner level which forms the base of the stupa. 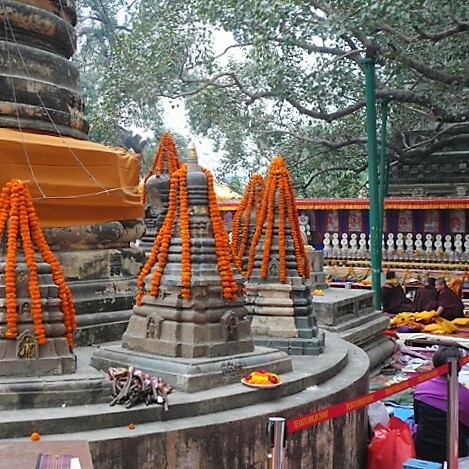 Here is the main Shrine where people constantly queue to make offerings and prayers to Lord Buddha. This level is also home to the Bodhi Tree and the Vajrasana seat where Buddha sat and attained enlightenment over 2500 years ago. This inner area is surrounded by a golden railing around which many people circumambulate or sit and recite prayers or meditate. The whole area is a hive of activity, including tourists who come to see this famous Mahabodhi Temple, which is also a world heritage site. It was quite something to see so many thousands of people together and yet most interactions took place remarkably smoothly. 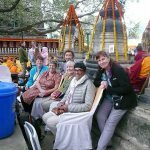 All participants in the Monlam were looked after very well, everybody was served tea and Tibetan bread or doughnuts during the breaks by the monks who worked amazingly hard to ensure that nobody was missed out. Bound copies of the Monlam prayers, as well as calendars and books, were all handed out to participants. A delicious vegetarian lunch was served by volunteers in the nearby Sikkim temple in a huge red and blue marquee. There was also the opportunity to make donations towards the Monlam, a very meritorious activity, along with dedications for people who were unwell, whose names were read out each day. The main focus of the Monlam is the prayers. These centre around the King of Aspiration prayers, previously taught and explained by Lama Jampa along with many of the other prayers recited, so we were fortunate to be in a good position to participate. Reciting these prayers for the benefit of all beings alongside His Holiness Karmapa and so many great lamas of the Kagyu lineage was very powerful and made this an amazing experience. 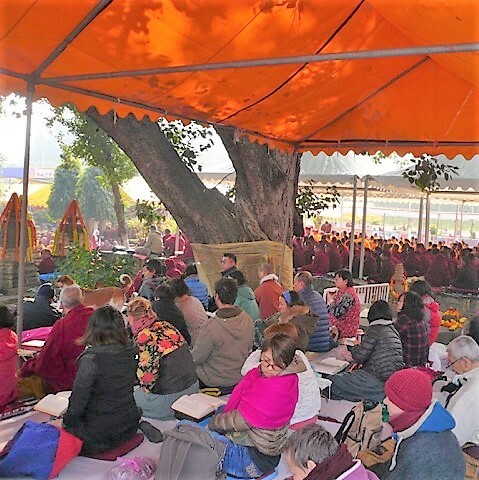 On the final day the monks distributed bags of tsok (food offerings) to everybody and we all threw handfuls of flower petals into the air with great enthusiasm during the recitation of the Tashi prayer for auspiciousness, making it a very joyful end to a wonderful Monlam. To read more about the Monlam and see pictures on His Holiness Karmapa’s own website, check out this page. To read more about our community, check out this page.